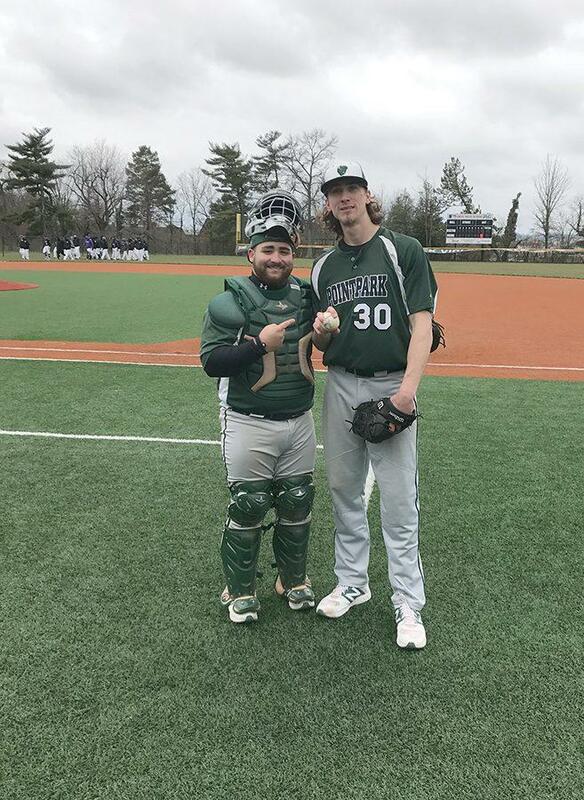 Senior pitcher Nolan Krivijanski stands with his catcher, junior Chris Hernandez, after tossing a 1-0 perfect game Saturday. The Pioneers swept the four-game series at Cincinnati Christian. Senior pitcher Nolan Krivijanski threw a perfect game Saturday to kick off Point Park’s four-game sweep of Cincinnati Christian University. All 21 batters that Krivijanski faced were retired in order. Thirteen pitches resulted in ground balls that the defense was forced to contend with, and Krivijanski struck out two in the contest. Junior right fielder Edberg Dominguez went 1-3 in the contest and scored five runs in the four-day series. Krivijanski said his defense was a key factor for him in the 1-0 victory. The only offense for Point Park during the game was an RBI single from senior shortstop Cole Johnson in the fourth inning. Senior outfielder Emmanuel Lopez scored on the play and Krivijanski needed no other support to seal the deal. “I’m blessed to have that under my belt,” Krivijanski said. The second game resulted in a 6-1 victory for the Pioneers. Sophomore pitcher Nicholas Beardsley pitched a complete game and earned the win. He gave up five hits, two walks and struck out six in the contest. The Pioneers took a 5-0 lead in the first inning and extended the lead to 6-0 in the fourth inning. “He’s a young guy, he’s going to have a lot of success for us in the future,” Krivijanski said regarding Beardsley. The offense was more productive Sunday for the Pioneers, who swept the doubleheader by the scores of 11-2 and 16-3. Point Park was tied 1-1 in the top of the second and broke open the lead by scoring four runs. In the fourth and fifth inning the Pioneers put up three runs. The offense finished the game with 16 hits. Johnson went 3-5 with two RBIs and scored one run. Senior pitcher Anthony Garofalo went five innings, giving up six hits, two runs and striking out one. Senior Logan Linder and junior Gustavo Barboza both pitched one scoreless inning in relief. The finale of the series had Point Park’s focus. The Pioneers struggled to finish their sweep of West Virginia Tech last week. The Pioneers scored four runs in the first, one run in the second and five in the third to lead 10-3 by the fourth inning. Junior pitcher Addison Domingo went five innings, giving up six hits, three runs and striking out three. Junior catcher Chris Hernandez went 2-3 with four RBIs and a home run. Johnson continued contributing with three hits. Point Park improved to 13-7 overall, and 8-4 in conference play. The Pioneers continue their River States Conference schedule this weekend at Asbury.